The majority of my digital design work comes from my role at Long View Systems. There, I create digital graphic designs for the web and print, create social media content, and perform a variety of tasks on their website. For graphic design, the vast majority of what my projects at Long View call for are photo edits and manipulation. Simple yet effective imagery that uses the company colours of yellow and green with tastefully combined stock and company imagery where the textual message is brought to the forefront. Below are a few specific types of digital graphic design that I have done for classwork, clients, or Long View Systems. I love designing logos. Logos are always a reflection of an identity but also an expression of creativity. Some of the logos I’ve created are text based and others are symbol based; it all depends on the what the client needs and what suits their identity best. For my designs, my process begins with rough pencil and coloured sketches. From there I choose the best of the designs and recreate them in Illustrator, while also creating a colour palette. I choose Illustrator as I can create vector designs that can be resized to any measurement without loosing details. A logo book is a detailed analysis of a logo. The book will tackle many of the ways a logo might be deployed, and how best to handle the logo in those situations so that the corporate identity remains readable and more importantly, standardized. A logo book can also branch out to larger corporate identity concepts such as what fonts to use and how to layout a letter. Vector designs are created in Adobe Illustrator. These clean looking illustrations are created with the precise placement of points and arcs. I love experimenting with new styles of vector designs and am excited to be adding more examples to this mini-portfolio in the near future. I use photoshop in a few different ways. One is to edit existing photographs, to either fix problems in the photo like light levels, clean up someone’s face, or to delete items in the image. I also edit photographs to add dramatic colour, bring colour to black and white images, and to make photomontages. A second usage for photoshop is to colour illustrations, creating flats and playing with various effects to give depth and character to the piece. A third usage is for creating designs, such as website mockups, magazine and book layouts, and singular graphics. I love InDesign. After gaining an understanding of InDesign you will never go back to Word! I use InDesign for pretty much an text based project that has multiple pages (posters are created in Photoshop or Illustrator). While I love InDesign, I rarely if ever use it without a little spice added from Illustrator and Photoshop. Whenever graphics and effects are added to the document, I create them in Photoshop or Illustrator. Sometimes after the document is finished I may also give it a few more edits in Photoshop to provide a more polished look. For the most part I have used Photoshop, Illustrator and most recently SketchUp for creating 3D Designs. 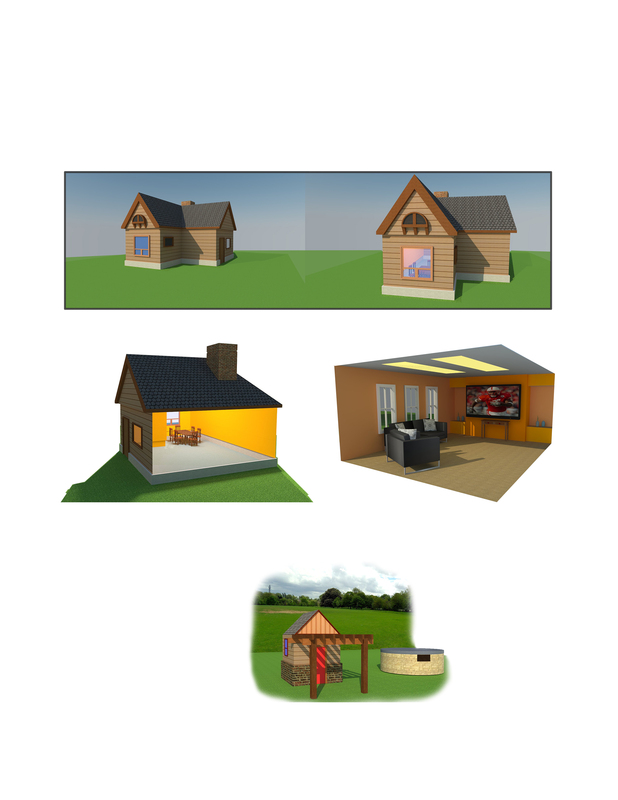 Here I have a few examples of structures I’ve created in SketchUp, with some based on tutorials.